Stop worrying about Trump being in Putin’s pocket. Start thinking of how to deal with him. Donald Trump’s attitude and statements both during the election campaign and after his victory have led many analysts to conclude that the new president of the United States will share an unprecedented cosy relationship with Vladimir Putin, the long-time president of Russia. 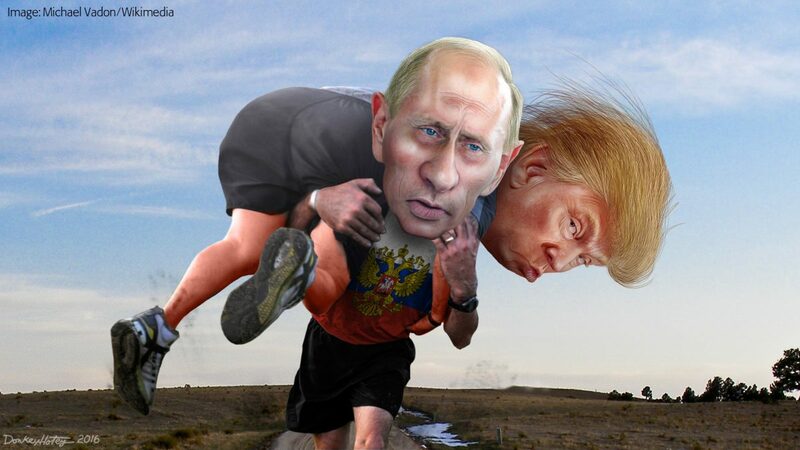 The uncharitable view is that Mr Trump is in Mr Putin’s pocket. The charitable view is that Mr Trump’s affinity for Mr Putin will cause US foreign policy to be less antagonistic to Russia. Here’s the thing though: for all his statements, posturing and actions, it is unlikely that Mr Trump is a sellout. Why so? First, his populist credentials will not survive a concession to Russia that hurts the United States’ interests or prestige. Second, the Republican party might have changed over the past few years, but cannot condone a pro-Russia policy where that is against the party’s institutional interests. Third, there are strong bureaucratic bases for foreign policy that cannot simply change because a new president is in power. Like every new head of government, Mr Trump will discover that once he occupies the office. Finally, for all appearances and commentary there is the possibility that Mr Trump is not Putin’s puppet at all. Some of the more astute analysts I have discussed the issue with think that Mr Trump will be the dealmaking, transactional president. What this means is allies, partners, neutrals and adversaries will need to figure out what they are prepared to concede to the United States obtain what they wish to procure. A deal is a deal only when there is mutual agreement on the give and the take. Mr Trump’s prejudices, campaign rhetoric and political interests will both determine his administration’s priorities and constrain his dealmaking. With Russia as with Japan. With China as with India. On climate change as with nuclear weapons, trade and so on. Seen from this perspective, Mr Trump might well have — intentionally or willy nilly — created favourable negotiating conditions with respect to Mr Putin. Consider. Will Mr Putin be willing to risk jeopardising a friendly relationship with Mr Trump should the United States push Russia to yield a little more on some issue? With Mr Trump in the White House, the Russian president will have to choose between a hard line on a specific issue and the long term advantage of having a friendly relationship with his US counterpart. He is unlikely to want to throw away his advantage quickly or cheaply. And if Mr Trump is the dealmaker that he believes he is, he won’t pass up this chance to secure an advantage. President Trump. What now for India? Peter Thiel, a Silicon Valley billionaire who backed Donald Trump’s candidacy, perhaps best explained the latter’s political appeal. Journalists and analysts, he said, took Mr Trump literally but not seriously, and wanted to know details of how he would implement some of the outrageous ideas he proposed. Ordinary people, on the other hand, took him seriously but not literally, and were persuaded that he intented to take policies in directions that they agreed with; the exact details didn’t matter. In the uncertainties that prevail in Washington and elsewhere on what policies President Trump would pursue, Mr Thiel’s explanation is a very useful signpost. It would only be conceit for anyone at this stage to predict Trump’s foreign policy positions. Candidate Trump and his core supporters were anti-immigration, anti-Muslim and anti-trade. Mr Trump threatened to pull out of NATO, repudiate free trade agreements, engage Russia’s Vladimir Putin, withdraw the security umbrella from over treaty allies, renegotiate the Iran nuclear deal, deal with ISIS, back Israel and grab the oil in Iraq. And yes, build that wall on the border with Mexico. At this point, it is best to take all these, as Mr Thiel suggests, seriously but not literally. To the extent that President Trump attempts to throw international regimes, norms and institutions up in the air, New Delhi will encounter opportunities that it must be prepared to seize. This means the level of diplomatic imagination and boldness in the external affairs, commerce and defence ministries must be boosted. India is far better placed today than ever before to take advantage of possible shifts in global order. Of course there are risks. A world that retreats from free trade will hurt India’s growth and development trajectory. A global recession will shave off significant percentage points from India’s economic growth rate. Throttling of free movement of people — in the US as in Europe — will necessitate painful business and human readjustments, although the result might be more business for India’s outsourcing/offshoring industry. Most of these risks can be managed by proceeding with structural economic reforms, or Reforms 2.0 (yes, I sound like a broken record, but the point is valid and important to make). The path to success in the world of President Trump is nimbleness, deftness and speed. New Delhi’s diplomats and policymakers will need to see the opportunities early and act faster than others, without being constrained by historical baggage. No pre-determined strokes: see the ball early and play it accordingly. Related Link: My colleague Pranay Kotasthane has an opinion piece on this in the New Indian Express today. Putin’s visit is part of a longstanding tradition of bilateral visits. It comes at a time when there is greater convergence of interests between India and the United States, than between India and Russia. That said, Russia bears greater responsibility for the divergence in relations with India, for it has almost gratuitously pursued an arms-sale relationship with Pakistan. Those sales have little utility other than sending unwelcome signals to New Delhi. New Delhi should welcome Mr Putin with great warmth and the traditional respect, despite his recent actions. Russia has been and can be a useful partner for India. For his part, Mr Putin would do well to reflect on how Russian industry can take advantage of Mr Modi’s “Make in India” initiative, especially in the defence and technology sectors. Samanth’s article is up on The National’s website. Don’t rush to take sides. This was my response to a journalist’s question on what I thought of India’s position on Russia’s annexation of Crimea. India neither has important interests nor the capability to be a useful player over Ukraine and Crimea. It is therefore sensible for New Delhi to let those with interests & capabilities play it out and deal with the outcomes. In any case, the Crimean case conclusively shows that the UN Security Council cannot be relied upon to uphold and enforce the UN Charter. If Russia’s annexation of Crimea leads to a wider armed conflict then New Delhi will have to review its position. 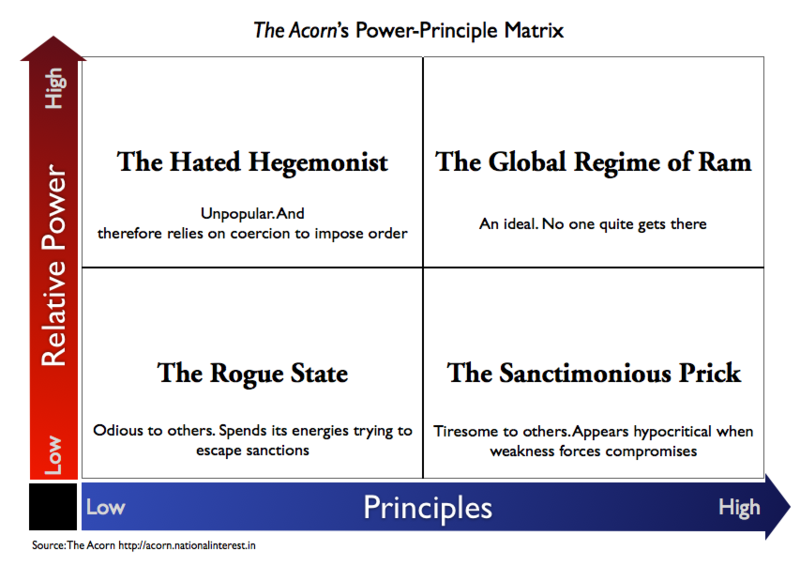 For context, see this post on the Power & Principle Matrix. Taking gratuitous moral positions is not a good way to conduct foreign policy. Let’s not forget that the principle of territorial integrity that the United States and European Union are invoking over Crimea was overlooked with respect to Kosovo a few years ago. A different principle—mass atrocities against the population—was invoked then. Clearly, interests determine which principle is evoked in international relations. As the Obama administration pushes for an earlier drawdown of U.S. troops, Kabul must quickly take responsibility for maintaining internal stability and charting an independent foreign policy. We asked four analysts—Michael O’Hanlon, Marin Strmecki, Amin Saikal and Nitin Pai—how Kabul should address the challenge. The heart of Afghanistan’s problem is that its natural desire for autonomy provokes strong resistance from Pakistan. Islamabad perceives anything less than a satellite regime as inimical to its interests, in turn driving Kabul to seek autonomy by reaching out to India, Iran, Russia and China. This vicious cycle of insecurity can be broken in two ways: reconfigure the Durand Line that separates Afghanistan from Pakistan, or change geopolitical attitudes in Pakistan. The latter is decidedly more painless, but requires getting Pakistan’s generals to change their minds. It is not going to be easy. Afghanistan then has to look for other solutions. To some extent, the Afghan state can look to New Delhi because India faces significant risks in the short term from a U.S. withdrawal. Triumphant militants and their backers in the Pakistani military establishment, fresh from defeating a superpower, might decide to turn their attention to Kashmir. This is what happened in the early 1990s when Pakistani and other foreign veterans of the anti-Soviet war in Afghanistan edged out local militants in the Kashmir valley and began one of the most violent phases of Pakistan’s proxy war. Hence India doesn’t want a repeat of the 1990s. There is however a sense in New Delhi that 2011 is not 1991. Only the most credulous today accept Pakistani denials that it does not use terrorism as an instrument of foreign policy. The good news then is that international pressure on Pakistan is likely to persist even after U.S. troops leave Afghanistan. Even so, New Delhi is hedging in four ways. First, as the recent agreements signed by President Karzai and Prime Minister Manmohan Singh show, India intends to further bolster the capacity of the Afghan state to provide for its own security. Training Afghan troops allows India the flexibility to raise or lower its security investments, depending on circumstances. Second, India is strengthening its relationships with Afghan political formations opposed to the Taliban. Third, it is attempting to improve bilateral relations with Pakistan, to the extent possible. Fourth, New Delhi is cooperating with other nations to keep the conflict contained within Afghanistan and Pakistan. But Kabul has its own internal problems that bedevil its foreign policy. The strategic logic in Mr. Karzai’s attempts at striking a balance in Afghanistan’s relations with its neighbors has been often overshadowed by the perception that his actions are mercurial and clumsy. That means his new friends in New Delhi, Beijing or in Moscow—with whom he is trying to get closer—may look at him with some wariness. What’s more, Mr. Karzai is keeping the Pakistani channel open at the same time. In this he faces determined domestic opposition from quarters that disapprove of his dalliances with Pakistan and its proxies. All of this makes for a heart-stopping tightrope act. Mr. Pai is founder of the Takshashila Institution, an independent think tank. Imagine Afghanistan without extra-regional powers like the United States, NATO and others. Its stability would depend on the stability of the balance of power between Saudi Arabia, Iran, Russia, China, Pakistan and India. The external actors would broadly fall into two camps, based on the degree of convergence of their interests: China, Saudi Arabia and Pakistan in the red corner, and India, Iran and Russia in the blue. This was roughly the situation obtaining in Afghanistan in the second-half of the 1990s towards the end of which the red corner seized a dominant upper hand through the military success of Mullah Omar’s Taliban regime. After 9/11, the US and NATO stepped in and disrupted the natural geopolitical dynamics of the region. Once external powers withdraw Afghanistan the natural geopolitics will again kick into action: with the China-Saudi-Pakistan triad seeking dominance over the landlocked country against the interests of India, Iran and Russia. The United States has the power to set the future trajectory by choosing sides. The tragedy of the last decade is the sheer inability or unwillingness (complicity or incompetence?) of the United States to appreciate the intrinsic geopolitics of the region. It would have done much better for itself and for Afghanistan if it had recognised how the fundamental interests of the region’s powers were stacked up, and aligned itself accordingly. The single most important reason for this, perhaps, was the dysfunctional relationship between Iran. There still is no love lost between Washington and Tehran. Worse, even as China consolidates its alliance with Pakistan and Saudi Arabia, the United States seeks to split India and Iran. For its part, India has shown no appetite for bringing about a rapprochement between the United States and Tehran. This must change, and 2011 has opened a window for India, Iran and the United States to attempt to increase co-operation over Afghanistan. Writing in the Washington Post, a well-connected Saudi commentator has declared a US-Saudi split. The Pakistani establishment is checking how much support it will receive from China before deciding how much to part ways with the United States. Before the killing of Osama bin Laden upset the scoreboard, General Kayani and Prime Minister Gilani had asked Hamid Karzai, Afghanistan’s president, to cut his links with the United States. In the current circumstances China doesn’t have to do anything bold: it just needs to wait. In contrast, even after Abbottabad, the United States remains wedded to a failed strategy of pretending that the Pakistani military establishment is its ally. This only strengthens the position of the China-Saudi-Pakistan triad, and weakens its own. New Delhi is unlikely to be persuaded that it enjoys a genuinely strategic relationship with the United States as long as the latter continues to scaffold Pakistan. Tehran has many reasons to be opposed to the United States. A good part of that is ideological. What gets less attention is the fact that the realists in Tehran have reason to be wary of the United States because they see Washington as the protector of both Israel and, more importantly, the Sunni bloc consisting of Saudi Arabia and Pakistan. There are some differences between New Delhi and Tehran, but nothing that can’t be resolved if Washington were to change course. Russia enjoys good relations with both Iran and India, and is likely to prefer such a re-arrangement of relations. If realism prevails in Washington, New Delhi and Tehran, their diplomats will be galvanised into working out how the three could co-operate, albeit in a limited context, over Afghanistan. It may be that nearly three decades of estrangement has left the tribal world of Washington policymaking with few advocates of making up with Iran. That’s why India has a role—it must muster up the imagination and diplomatic chutzpah to attempt this project. It is frustrating to see resigned minds give up before even trying. Related Links: Lubricating a US-Iran rapprochement (from this blog’s archives) and Neil Padukone’s issue brief at CLAWS. It’s not a New START. It’s a False START. That’s like saying that the history of Wall Street is replete with quirky accounting rules that do not easily correspond to reality on the ground, and Enron is no different. The experts it quotes do a much better job in describing this scam. Let’s put this in perspective: under the New START treaty the number of US warheads “not counted” is around the same as China’s entire nuclear arsenal. Just remember this the next time Mr Obama gives a rousing speech on nuclear disarmament. At this time though, White House officials are apparently engaged in trying to justify why nuclear warheads on bombers are somehow more okay than nuclear warheads on missiles. Will they accept this reasoning if it came from Tehran? In today’s Indian Express, Rohit Pradhan and I renew our call for India to send troops to stabilise Afghanistan. It summarises the arguments we have made in on INI and Pragati and addresses the most popular objections to the proposal. Over time, a co-operative arrangement between India, Iran and Russia could form the bedrock of a regional solution to a stable Afghanistan. Unfortunately, the very mention of an overseas military deployment runs into a dogmatic wall of domestic opposition. First, the bad experience of the Indian Peace-Keeping Force (IPKF) in Sri Lanka in the late 1980s is brought up as if that episode should cause India to for forever foreswear the use of its armed forces beyond its borders. Apart from the significant differences in context, the Indian army has accumulated two decades of counter-insurgency experience in Kashmir and elsewhere that makes it a qualitatively different force from what it was before the Sri Lankan intervention. Second, it is argued that sending Indian troops to Afghanistan will be seen as anti-Muslim. On the contrary, it is ordinary Afghans, a vast majority of who are Muslims, who will be the biggest beneficiaries of an Indian intervention. How can supporting the legitimate government of the Islamic Republic of Afghanistan be anti-Muslim? The idea that fighting the Taliban is a war against Islam is a misleading canard that only benefits the likes of Osama bin Laden and the Pakistani military-jihadi complex. Third, it is not true that the Afghan people are uniformly hostile to foreign troops as it is frequently made out to be. Western troops were generally welcomed as deliverers when they expelled the Taliban regime in 2002, and recent surveys indicate that a majority of the Afghan people still support their presence. The notion that Afghans resent all foreigners is borne out of colonial romance and modern ignorance — ground realities suggest that Afghans seek security and good governance, like anyone else in their situation. But can India afford to station troops abroad? Some critics of the idea estimate that it costs Rs 1 crore a day to maintain a brigade in Afghanistan. Let’s put this in context: last year, the defence ministry returned Rs 7000 crore of its budget due to its inability to spend it—enough for 19 brigades. We cite this to suggest that financial considerations do not rule out the option of foreign troop deployments. Related Links: Sushant K Singh (August 2008); Rohit Pradhan & I (January 2010) make the case for India to step up its military presence in Afghanistan & an online panel discussion (January 2010) on Offstumped. 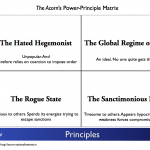 Zbigniew Brzezinski, like many others who came of age during the Cold War, believes that a bipolar world is much easier for the United States to ‘manage’ than a multipolar one. That might even be correct. The problem is—the world is not bipolar—even in the face of China’s emergence as one of the world’s great powers. Instead of dealing with the world as it is—an eminently realist enterprise—Mr Brzezinski recommends dealing with the world as he believes it ought to be. Earlier this year, after commemorative event in Beijing, he called for an ‘informal’ G-2 comprising of the United States and China. It is one thing to argue that the US-China bilateral relationship is one which is most important to the world, but quite another to call it “G-2” suggesting it would engage, in some form, in the task of global governance. Mr Brzezinski misses the point that an important reason why the US-China relationship is seen as important is because it is a problem. It is important to the rest of us in the same way as Pakistan is for international security. So just like how you wouldn’t entrust Pakistan with the job of ensuring international security, you wouldn’t entrust the United States and China with the task of global governance. Unfortunately, this G-2 mindset is not merely Mr Brzezinski’s hobby horse, but is influencing the Obama administration’s foreign policy. “US-China consultations regarding India and Pakistan,” the former argued, “can perhaps lead to more effective even if informal mediation, for a conflict between the two would be a regional calamity.” Sure enough, the joint statement at the end of President Obama’s summit with President Hu Jintao included a words that said that “the two sides welcomed efforts conducive to peace, stability and development in South Asia.” Clearly, there is an attempt by the two countries to get China involved in India’s relations with Pakistan, as well as in Afghanistan. It shows that President Obama thinks or wishes that the world is bipolar. But it is not. New Delhi is unlikely to be too impressed with such gratuitous references—in fact, it should react with deliberate irrationalism. Diplomatic games apart, the idea of Chinese involvement in India-Pakistan relations is dead on arrival. Mr Obama perhaps forgot what happened after he floated the idea of appointing a special envoy for Kashmir, during his election campaign. In any case, the simultaneous appearance of pro-China governments in Japan, Taiwan and Australia might convey an impression that these countries will play second fiddle to Beijing. Yet this can change at their next elections, or even earlier. Also Iran, Russia and Saudi Arabia are unlikely to join the US or China camps. Unfortunately for the United States, a combination of national indebtedness and a declinist narrative have found purchase in Barack Obama’s worldview. The Brzezinski bipolar disorder isn’t making the world any more bipolar. If President Obama continues on the path he has taken during his China trip, the world will become, paradoxically, more multipolar. That’s because the relative power of the United States will decline, China’s will improve and the two will be in the same league as handful of others. What would India’s soft power be without Bappi? In its June 2009 edition, the Proceedings of the Centre for Soft Power Studies reported how Jimmy Zingchak holds sway over the people of Kazakhstan. Today it brings to your attention the wonderful Tajik Jimmy—whose career mirrors that of the Jimmy incarnation. Baimurat Allaberiyev, who herded sheep for a salary of one lamb per month is now rocking Russia.